I take hundreds of photos at the Disneyland Resort, and the ones I keep go into a queuing bin on my computer for future processing and featuring on my blog. But the downfall of taking so many photos is that I never have time to edit them all, and so some just sit. The upside of that? Well, sometimes, I'll find a really nifty shot that I suddenly remember I meant to work on, only I became distracted or ended up going on another photo run that yielded other photos. This angle is one such example. I've photograph Cars Land numerous, numerous times, and I've even snapped countless pictures of Ornament Valley from this angle, but on this particular dramatic winter sky day, I intentionally tilted my camera up to capture more of the sky than of the land. And the result evokes visions of the Old West and its majestic, wide open spaces. 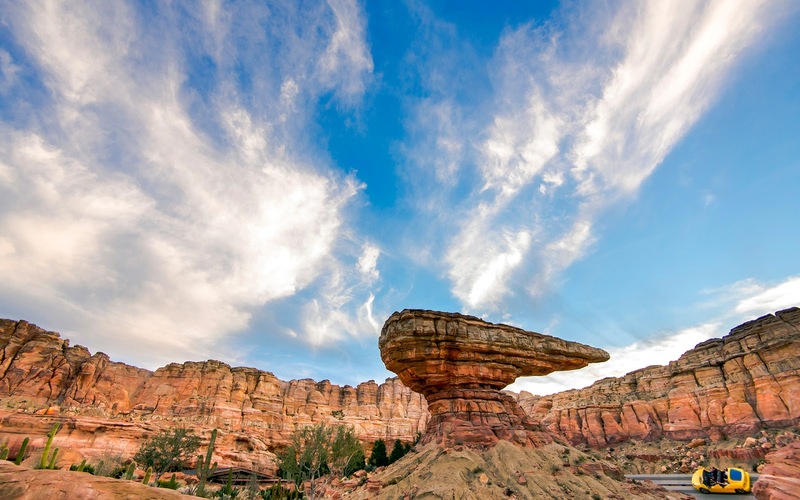 The shimmering blue of the sky and the earthy orange of the rocks form a beautiful couple, and if it wasn't for the iconic shape of Willy's Butte (and the Radiator Springs Racers cars), I'd venture to say that this shot could very well be mistaken from something at a real national park! Beautiful winter skies blaze above Ornament Valley, in Cars Land!